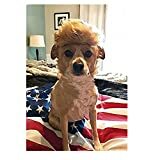 No matter whether your pet is a Democrat or Republican, Liberal or Conservative, dog or cat, animal or fur baby... seeing it wear a Trump wig is still kind of hilarious. I think we're still allowed to laugh and have fun? Anyways, this Halloween, when you dress up your furry best friend in this cool new Donald Trump Pet Costume, half of the trick-or-treating population will either flee in total unhinged terror at the sight of a scary monster with a bad combover or they'll see your dog or cat dressed up as a billionaire superhero fighting to make America great. 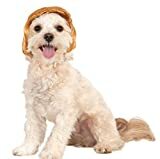 This politically divided pet costume includes the signature Trump hairstyle wig and an adjustable Stars and Stripes necktie - red MAGA hat not included.